Find out how InLoox PM helps achieve successful project delivery within budget. Maintaining a complete overview of all project expenses and revenues is one of the key aspects in successful project controlling. InLoox PM project management software helps you with this complex and detail focused task. In order to establish company wide cost controls in an efficient and timely manner, it is crucial to base project related decisions on most up-to-date key project data. InLoox helps you establish the project cost transparency that's necessary to quickly react to changing project requirements. Analyze project related real-time key figures, deadlines and milestones and receive an overview of all relevant budget positions and expenses at any given time in the project plan. Additionally, you can create and access powerful project reports. InLoox PM makes even multi-project controlling simple and efficient with the comprehensive budget analysis tool accross multiple projects. 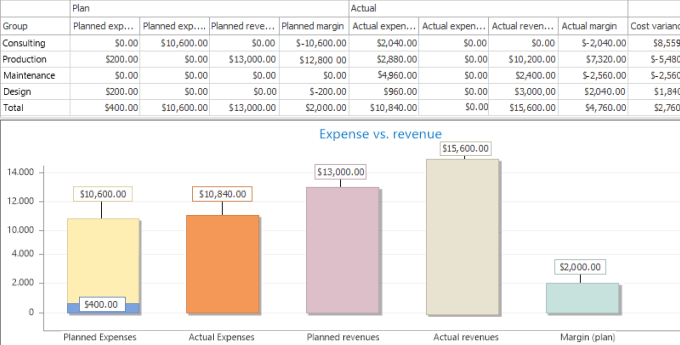 The InLoox PM budgeting feature automatically generates plan/actual comparisons for expenses and revenues in your projects. This makes continuous monitoring and controlling of project key data extremely easy and comfortable. With our project management software you can achieve successful project delivery on time and within a given budget. Thanks to the integration with Microsoft Outlook, all project related appointments, deadlines and milestones are available in your Outlook calendar and task list. Using one central platform makes continuous tracking and managing of essential project information extremely comfortable. Say goodbye to time consuming juggling of multiple software programs and redundant administration effort. InLoox PM does all the syncing for you to help you get more done in less time. Do you always know the most up-to-date financial information of your projects? Often times, related labor, communication, travel costs and other expenses are only partially billed to the relevant project. Not with InLoox PM: The software is designed in a way that makes the project the "container" for all cost categories. In a first step, define budgets and cost centers in order to provide plan values for departments, teams and employers. With InLoox you can calculate project costs on a freely customizable scale. Analyze total project costs or create a detailed point of cost list that features every single production materials - it's all up to you. The InLoox project controlling feature provides the basis for an accounting friendly data structure. If you prefer doing the final project accounting directly in InLoox, that's possible too. Our software's simple invoice management feature facilitates continuous accounting of one or several projects, in parts and total. After you're done with creation of project related invoices, you can simply export them as PDF or HTML files for further reference. Generating an overview of all project relevant invoices and exporting the list in a Microsoft Excel file is just easy. Gain real project advantage, working with most up-to-date key figures and project information. With the most current project information at your hands, you gain knowlege and time benefits in any aspect of project controlling. Additionally, critical project information is organized in a compact structure, making it extremely transparent and a solid base for project analysis and comprehensive project reporting. This makes InLoox an ideal tool for project analysis and early-warning system. Determine company wide project management standards with one easy-to-use software solution - and every department and teams involved will reap the benefits from the unified system. It is very important to account for existing corporate structures, processes and procedures. Thanks to InLoox's perfect integration with Microsoft Outlook and its compatibility with other programs based on the Microsoft technology like Microsoft Exchange Server and Mircosoft Share Point, the software can much easier be established as the new project controlling standard than any other solution in the market. Professional Project Controlling - The Easy-to-Use Software by InLoox • Copyright 1999-2019 © InLoox, Inc. All rights reserved.